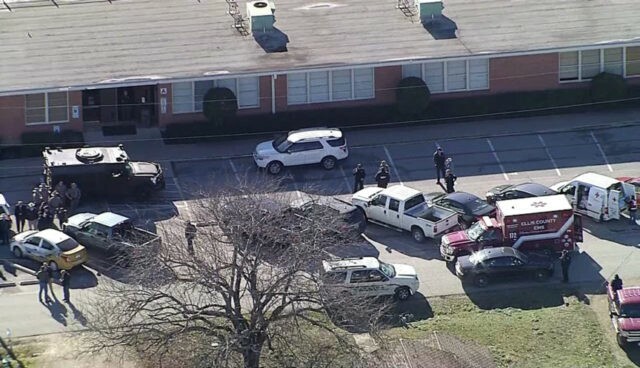 ITALY, Texas (AP) — A 15-year-old student in Texas was injured in a shooting in her high school cafeteria Monday morning and a 16-year-old boy, also a student at the school, was taken into custody, sheriff’s officials said. The girl was airlifted to Parkland Memorial Hospital in Dallas following the shooting in the town of Italy, some 45 miles (70 kilometers) south of Dallas, said Sgt. Joe Fitzgerald of the Ellis County Sheriff’s Office. Fitzgerald said he did not know how many students were in the cafeteria at Italy High School when the shooting happened at about 7:50 a.m.
Lee Joffre, superintendent of the Italy Independent School District, which has about 600 students, said the shooter left the building immediately after opening fire. Sheriff’s officials say the boy was found and taken into custody without incident. Fitzgerald and Joffre both said at a news conference that they don’t know the relationship between the victim and shooter. Neither knew the girl’s condition, and Parkland spokeswoman April Foran said she could give no information. “This is a trying time for our community and our school,” he said. Italy, which promotes itself as “The Biggest Little Town In Texas,” has about 2,000 residents and is located just off Interstate 35 between Dallas and Waco.